Although the IBM PC was introduced in 1981, its eventual impact on the world of serious microcomputing in the early 1980s wasn't obvious. It took one or two years before the business world was completely sold on 16-bit machines and PC-compatibility. In the meantime the CP/M operating system was a common choice for business-only disk-based machines. Epson entered this market in 1983 with the QX-10. This was a slim, stylish model designed to provide all your business computing needs. Powered by a 4Mhz Z80 processor the machine was fast, and could provide a memory of 256k (bank-switched). Although monochrome, it had good graphics capability and also sported expansion slots for extra cards. In the U.S.A. it was bundled with an integrated OS/Applications package called Valdocs but here in New Zealand (to my knowledge anyway) it simply came with good old CP/M. Although the engineering and design was high quality, it was steamrollered in the marketplace by the move to 16-bit Intel 8088 PC-DOS/MS-DOS machines, which could all sing that sweet refrain “IBM-PC compatible”. The 8-bit CP/M (or Valdocs) QX-10 never took off. This one’s in good condition externally, although a little yellowed in places. It will get the retr0Bright treatment at some stage. It goes well now but has had its share of issues. Along with those described under the link, at one point Drive A stopped working. The fault was traced to a small board within the drive. Diagnosis of the exact component on that board was difficult so my solution was to buy a second parts-only QX-10. This gave me the replacement board and the machine was soon up and running again. It's always good to have spare parts for these old computers. I've got several manuals for it, and software from the Internet gave me working disks for CP/M+ and other applications. I’ve always wanted one of these models. 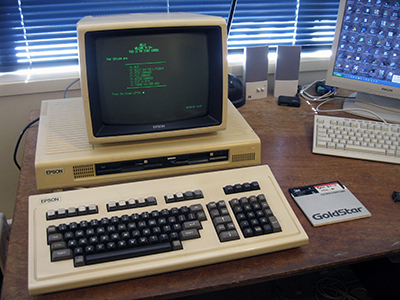 Although it is not a classic computer in the true sense of the word, I love the slim, flat design and the cool, crisp green-screen output. The slim form-factor also extends to the disk drives which are 2/3 of the height of standard ½ height 5.25 inch ones. To me it represents a class of computer which deserves at least a footnote in history; an example of the classy 8-bit CP/M business computers which came out of Japan during the early 1980s.